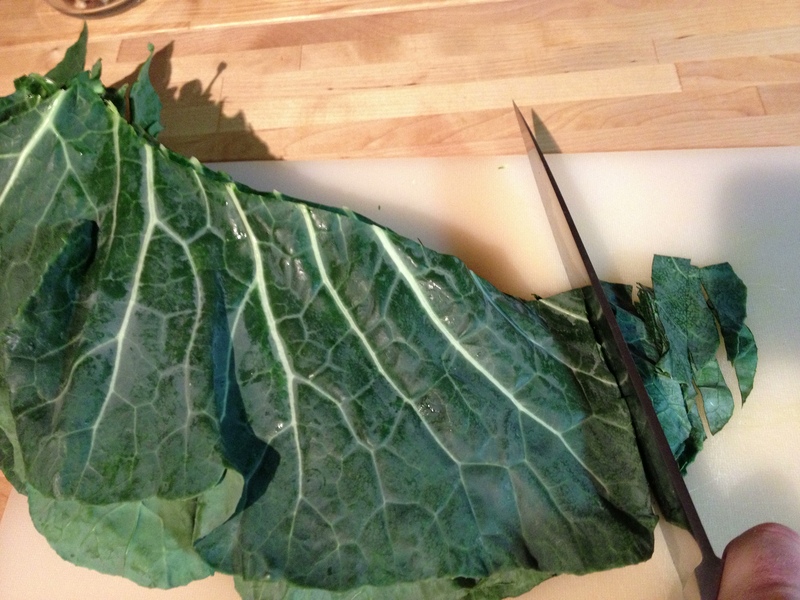 Collard are a quintessential southern food and my family in South Georgia grows delicious, tender collards. My family usually prepares collards (and other greens) by simmering them with ham for seasoning and serving them with pepper sauce (vinegar infused with hot peppers), using cornbread to soak up the juices from the collards (aka pot liquor). While I do like greens prepared this way, I usually cook greens at home by giving them a quick saute in olive oil and garlic, splashing them with lemon juice, vinegar, or a little red wine before removing them from the heat. Looking for a different way to prepare a bunch of collards my parents gave us from their garden, Jill came across a recipe for Spaghetti with Collard Greens and Lemon from Martha Stewart’s Whole Living website. For some reason, I wasn’t feeling the spaghetti, nor could I find farro spaghetti at the store. Inspired by the Martha Stewart recipe, but not wanting quite what that recipe described, I created this recipe for Collard Greens with Gamelli and Chicken Sausage. 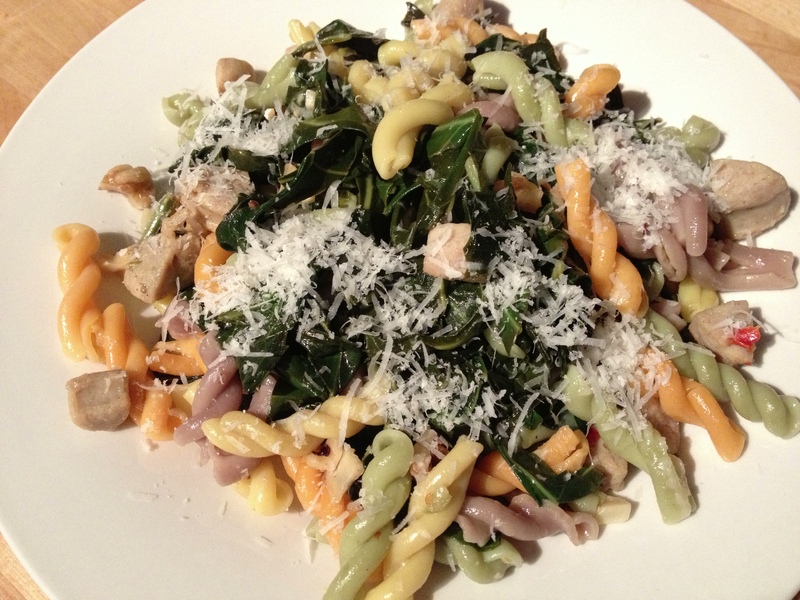 In this recipe, I especially like how the sweet earthiness of the greens and the sweetness from the chicken sausage pair with the acid from the lemon juice and the saltiness of the Parmesan while the pasta gives the dish more body and substance than just sauteed greens alone. Bring a 5-quart pot of water with 1/2 teaspoon of salt to a boil and cook the pasta for the amount of time specified in the instructions on the package for the pasta. While the pasta cooks, heat the olive oil in a 3-quart saute pan over medium heat. Heat the garlic in the oil for a minute and add the pepper flakes. Let the garlic and pepper flakes infuse the oil for about a minute, stirring enough to keep the garlic from burning. Add the chicken sausage to the saute pan with the garlic, pepper flakes, and oil. Once the edges of the sausage begin to brown (about 3 minutes), add the thinly sliced collard greens to the saute pan. 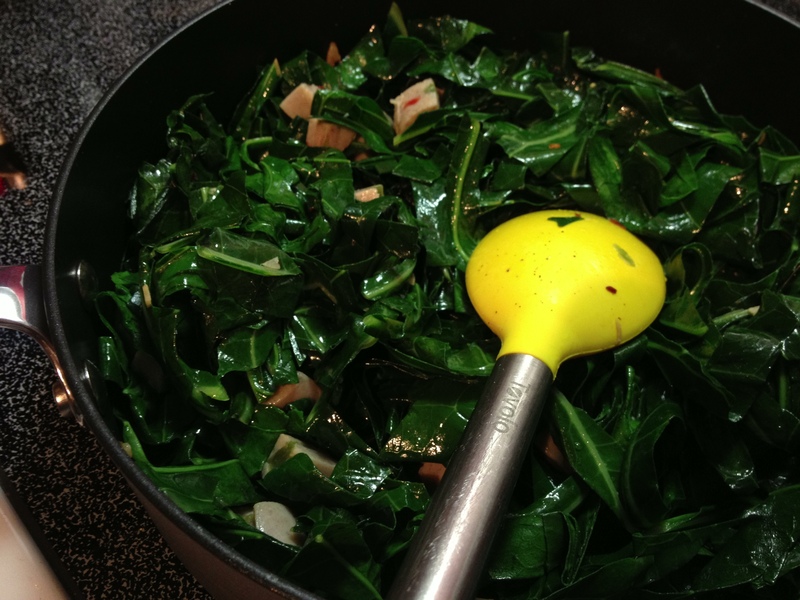 Toss the collard greens to coat them with oil and drizzle in the lemon juice. Drain the pasta, reserving 1/4 cup of the pasta water. 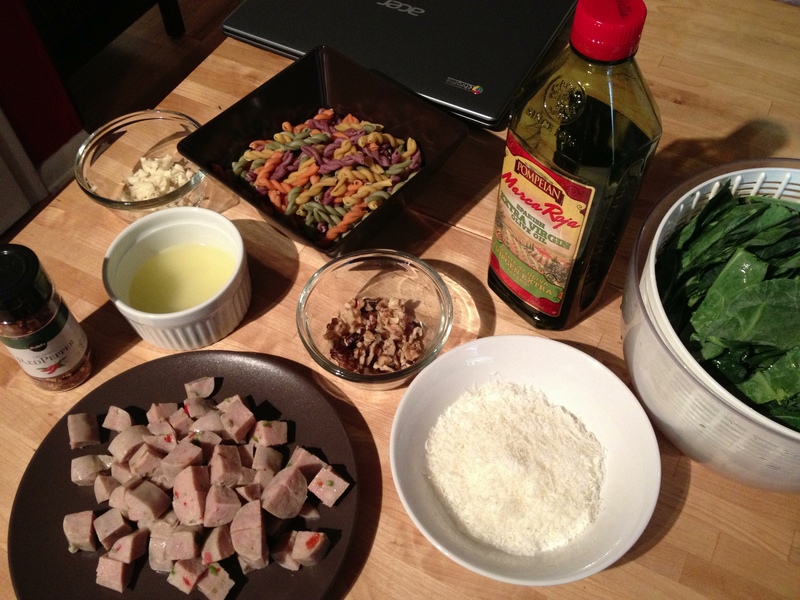 Toss the pasta with the collars and chicken sausage mixture. Add in the pasta water and stir gently. Season with salt and black pepper to taste, about 1/2 teaspoon salt and 1/8 teaspoon pepper. Toss in the chopped walnuts. Sprinkle in half of the grated Parmesan cheese and mix gently. 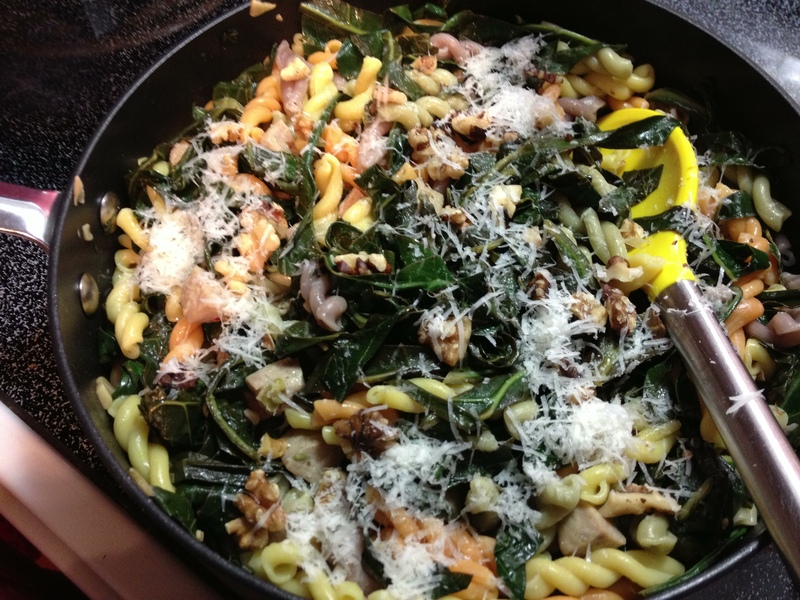 Serve the Collard Greens with Gemelli and Chicken Sausage, garnished with more grated Parmesan cheese. Serves 4.